“For the Nintendo 64 twentieth anniversary tribute held at GA HQ, at long last I finally finished the picture I was doing for it! I chose Bust-a-Move ’99, a game I played relentlessly as a kid. A neighbor let me borrow it, and I kept borrowing it over and over til he finally just gave it to me cuz I played it so much more than he did. It’s such a fun, colorful and addictive game. I hardly remember anything about it cuz it was just so long ago, but I definitely do remember the characters, the sounds, and the bubble-popping puzzling gameplay. But even with how much I played, I never did unlock the two N64-exclusive secret characters. 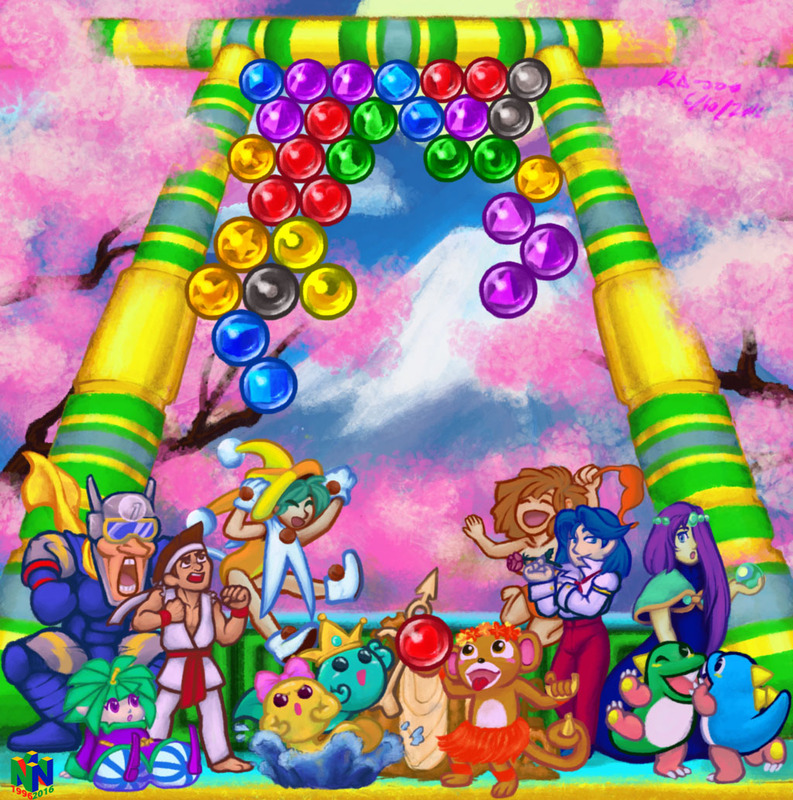 I put those two characters, the little monkey and the pair of alien tadpoles, as the ones at the helm of the bubble shooter to highlight them since this is an N64 tribute specifically. I wanted this picture to be colorful, which amazingly enough I feel like I pulled off. And I opted for a more playful, thick coloring style to try to match the feel of the game. I’m not sure if I should have done more with the background, but I think I like it. Hah, as much trouble as I had pulling this piece together, I think it actually turned out really well in the end! BOY I can’t believe how long it took me to finish this, and even more can’t believe I actually was able to. Things just keep happening to me orz I had to restart this picture from scratch I think four times, and would go months at a time between being able to work on it because of stuff happening in my life. I don’t even know if things are good or not in my life right now either :,D I dunno I’ll make a journal about it or something. Bust A Move’99 was released in November 1998 in Europe as its first N64 release, the USA and even Japan received this late updated port of Puzzle Bobble 3 (1996) in February ’99. The Puzzle Bobble series was pretty popular in the Arcades and also on the Playstation and it was only because Akklaim (went bankrupt a few years later sadly) that the Nintendo 64 got one of the games finally in late 1998. The European version was called Bust A Move 3DX. 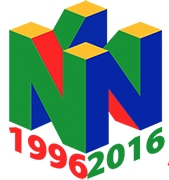 One of the main features of the Nintendo 64 port was the multiplayer mode for up to 4 players. It was quite the surprise to see this game being claimed for our Nintendo 64 Tribute. As someone who enjoyed the whole series since Bust A Move 2 on the Playstation I want to thank Ra-ooo for taking it. *5*!